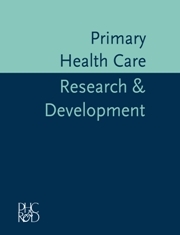 Primary Health Care Research & Development is a fully open access journal aimed specifically at both researchers and practitioners in primary health care, bridging the gap between academic primary care and practice. It provides a forum for the publication of international, interdisciplinary research and development in primary health care. It is essential reading for all involved in primary care and we welcome manuscripts from all disciplines: nurses, GPs, health service managers; professional and local groups in community health; researchers and academics; commissioners of primary health care services; allied health professionals including physiotherapy, occupational therapy, clinical psychology, counselling and health-related consumer groups. PHCR&D welcomes papers across the full range of research and evaluation methodologies. In addition to typically clinical research papers we also wish to include research and evaluation of innovations in education for primary care and also studies that address the workforce issues that face the primary care environment in the context of population health needs and economic change. Implementation of research and evaluation into primary health care practice is also an area of significance to the journal and studies that directly address the challenges and successes of implementation are welcomed by the editors. In all papers, authors should demonstrate how their research or development study relates to primary care both in the context of their own country and internationally.